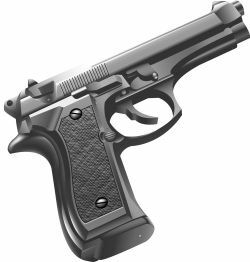 The other day I saw on Twitter someone mentioned a possible solution to the gun debate that heated up after the mass murder in Newtown Connecticut. It basically said – Guns don’t kill people, ammunition does and the 2nd amendment doesn’t say anything about ammunition. What a great idea. 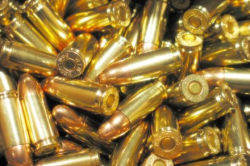 We should ban ammunition. That would allow people to keep their guns and would reduce the chances of more mass murders. This entry was posted in Culture, Politics, Progressive and tagged 2nd Amendment, ammunition, civil rights, debate, Firearms Owners Protection Act of 1986, gun control, Gun Control Act of 1968, Newtown school shooting, regulation on January 10, 2013 by Doug. The NRA may not have pulled the trigger at the elementary school in Connecticut but they can’t avoid any blame since they fight for little or no gun laws and benefit from and promote an irrational public fear that drives gun sales. The press conference they held on Friday 12/21 proves the point that they don’t really care about mass killings accomplished after their hard work. They now join tobacco and alcohol producers who also refuse to accept any blame for killing people and work to get legal protection. They have joined the merchants of death. This entry was posted in Culture, History, Media, Politics, Progressive and tagged 2nd Amendment, Bill of Rights, children, Connecticut, debate, government, libertarian, mass killing, National Rifle Association, Newtown school shooting, NRA, police state, press conference, shooting, spree killing, violence, Wayne LaPierre on December 22, 2012 by Doug. On Tuesday, October 16th, President Obama and Mitt Romney will have their 2nd of three debates at Hofstra University. It will be a town hall style debate, with questions asked by undecided** voters, which means there won’t be any podiums and the candidates will get to walk around. I’m sure you’re like me and you have other things to do and don’t want to watch the full debate, I’m going to put on my pointy election debate cap and make a prediction on the winner. 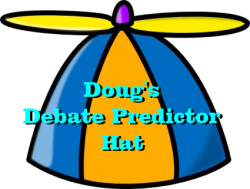 This entry was posted in History, Media, Politics and tagged 2012 US Presidential Election, corporate media, debate, Doug's Debate Predictor Hat, Hofstra University, Mitt Romney, President Barack Obama, undecided voters on October 15, 2012 by Doug. 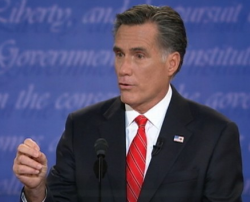 As if it wasn’t understood before Wednesday night, in Denver, Mitt Romney will lie in order to get elected. His talking points in the debate contained as many lies as Paul Ryan’s RNC speech in August. I don’t know about you but I want a President who won’t lie on a whim. Mitt Romney just isn’t electable. This entry was posted in Politics, Television and tagged 2012 US Presidential Election, debate, Denver, fact checking, false talking points, GOP Fail, lying, lying by omission, Mitt Romney, style points, truth on October 4, 2012 by Doug. As much as the crowd reaction, during the recent CNN Republican Debate, to the hypothetical person without health insurance dying angered me, I wasn’t that surprised. The heartless bastards that make up the Tea Party Republicans and who are in love with Randian Ron Paul have been around for many years. A friend of mine asked what did Paul want us to do, put donation jars on the counter of every convenience store and restaurant in the country to help those without insurance. The graphic below is what such a donation jar could look like. This entry was posted in Life, Politics and tagged cheap labor conservative, debate, GOP, graphic, health care reform, Republicans, Ron Paul on September 20, 2011 by Doug.